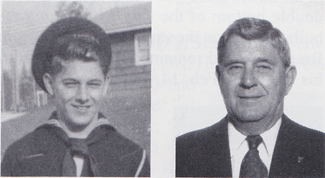 Morgan Jay Pulver, Seaman l/c, born June 6, 1925, Wingdale, NY. Enlisted in the USN June 2, 1943, and was stationed at Great Lakes, Balboa Park, San Diego, CA and Pudget Sound Naval Shipyard, Bremerton, WA. He served aboard the USS West Virginia from November 1943-February 1946. The ship returned to Pearl Harbor, sailed to Ulithe, Leyte Gulf, Iwo Jima, Okinawa and Tokyo Bay. Memorable experience was crossing the Equator, signing of Peace Treaty at Tokyo Bay and going ashore at Yokohama, Japan. He was discharged at Lido Beach, NY on Feb. 25, 1946. Awards: American Theater, WWII Victory, Asiatic-Pacific w/4 stars and Philippine Liberation w/2 stars. After the war, he was a locomotive engineer for the NYC RR for over 30 years. He retired in 1985. He and his wife, Elizabeth, have one daughter, Eileen, and two grandsons.